One of my favorite snacks of ALL TIME is popcorn! I love all forms (except kettle corn, which is probably the only kind they serve in H-E- double hockey sticks. So there you’ll be in the hot, hot heat, hangry and needing a snack. Then, you’ll think you’re getting normal popcorn and eat a handful of it… Well looks like the jokes on you sucker, it’s kettle corn! Then the salty-sweet oily taste will linger because there’s no water over there to rinse your pallet, while little red damon babies dance around you laughing and pointing at you…) So yeah, other than kettle corn, I can’t get enough of it. Here is a super yummy herbed variety that you can make at home, recipe by the gorgeous and talented Veggie Lisa! 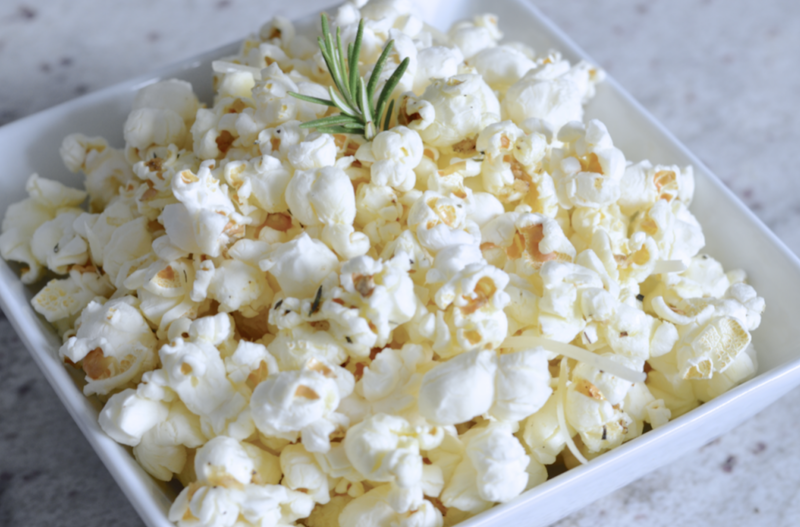 Check out the recipe and comment below on your favorite variety of popcorn, or if you hate kettle corn. In a small saucepan, combing olive oil, garlic, and one spring of rosemary. Allow to heat and simmer lightly. Once it starts to simmer rapidly, remove from heat. Add garlic salt and pepper. Pour over popcorn. Once cooled add the cheese and serve immediately. Will keep in airtight container for up to 2 days. This popcorn also makes a great topper for soups and salads in place of croutons.